Achondroplasia is a autosomal dominanat genetic (inherited) disorder that causes abnormal bone growth that results in a type of dwarfism. Autosomal genetic disorders affect a single gene on an autosome while the other gene is usually normal. There are two different inheritance partterns that are called dominant or recessive, depending on which type of gene has been mutated. Achondroplasia has one normal gene, giving a person that has this disease a fifty percent chance on passing on the gene to their offspring. However, if there are two copies of the mutant genes in one parent, it could be very fatal to the offspring, giving it a twenty five percent chance of the child death (stillbirth) before or after birth. 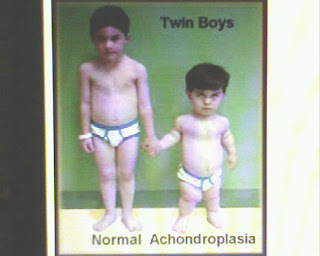 Two other syndromes with genetic disorders similar to achondroplasia are hypocondroplasia and thanatophorphic dysplasia. The growth of the brain and the intellectual level is usually normal, but the growth of the body and the limbs are disproportionate throughout the whole body. Irregular growth of bones and muscles in the body can cause compression of the spinal cord or obstruction of the airway passage, which is the common cause of infancy death. Obesity is a major issue that arises from achondroplasia due to the short body satuture. Achondroplasia can be detected through clinical examinations. A prenatal ultrasound can be done before the birth of the child to test for the mutant genes in the DNA. The other ways in which this disorder can be detected is by the slow motor responses and movements as well as low muscle tone in the child. There are no treatments present that are for achondroplasia today, however, there are surgical procedures that lengthen the limbs of the body. People with achondroplasia usually live life normally just like people who do not have this genetic disorder. Most people with achondroplasia do not hold back on physical acitivity or change their ways of living due to their height. if you are looking for breast lift treatment in delhi and breast lift Surgery in Delhi .